If Pikachu ever saw this envelope, he would get so excited that his lightning bolts would probably destroy our building. So instead of that idea, we're going to let Ash show him the envelope before a battle. They’ll be sure to win. Mini sized, cute, yellow, and full of an energetic vibe (just like Pika), this envelope will keep all of those receipts for any Pokemon (or non Pokemon) items organized. So that one day when your son or daughter decides he/she isn't a Squirtle fan anymore and now chooses Pikachu, you won't have to worry. They probably saw your yellow envelope and decided to change their favorite just because of that. Our electric yellow envelopes are sure to convince anyone, no matter their age, that yellow is an awesome color to have around! 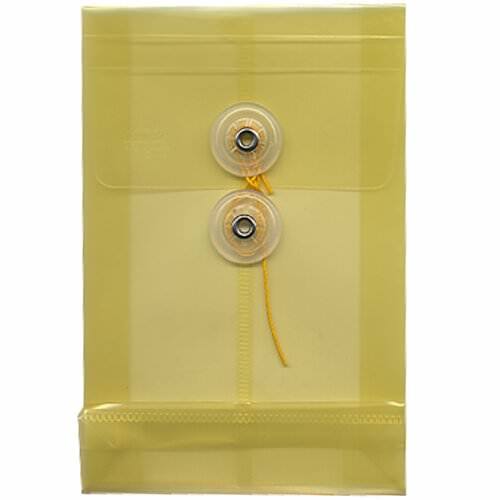 Yellow A6 Plastic Envelopes measure 4.25 x 6.25 and close with a Button and String Tie. These small yellow poly envelopes will last a long time! Perfect for receipts or storage.